A significant body of prior work has devised approaches for automating the functional testing of interactive applications. 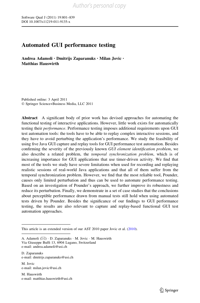 However, little work exists for automatically testing their performance. Performance testing imposes additional requirements upon GUI test automation tools: the tools have to be able to replay complex interactive sessions, and they have to avoid perturbing the application's performance. We study the feasibility of using five Java GUI capture & replay tools for GUI performance test automation. Besides confirming the severity of the previously known GUI element identification problem, we also describe a related problem, the temporal synchronization problem, which is of increasing importance for GUI applications that use timer-driven activity. Based on an investigation of Pounder's approach, we further improve its robustness and reduce its perturbation. Finally, we demonstrate in a set of case studies that the conclusions about perceptible performance drawn from manual tests still hold when using automated tests driven by Pounder.